Ice Cream & Sprinkles Birthday Party! Ok, this theme for a little girl’s birthday party is just TOO CUTE! The client called and asked if I would help her with an ice-cream-and-sprinkles-themed 3rd birthday party for her adorable daughter, Mackenzie. She needed coordinating cake, cake pops, cupcakes, and cookies to serve about 70 people (whew!). Her color scheme included mint green and light pink, so I took those colors and got to work. The treats for the 70-or-so guests included this tiered cake (8″ pink velvet and 10″ vanilla bean)…. cake pops made with mini ice cream cones (so adorable!)…. cupcakes baked in cones with creamy swirls of multi-colored buttercream…. The tiered drip cake was so fun to do…and so popular right now! The melting ice cream cone topper is simply a huge cake pop made in a sugar cone. I filled the cone with cake and drizzled it with pink melting chocolate. I also inserted a cake pop stick to ensure it would sit securely on the cake. The pink drip is white chocolate ganache with pink gel color, smoothed over the top and dripped down the sides of the cake. And, of course, sprinkles (actually sequins)….LOTS of sprinkles! I covered the bottom of the top tier with MORE sprinkles and a ruffly buttercream border. The #3 on top and name plate on the side are cut from homemade marshmallow fondant. Instead of a stick, the cake pops are made in mini-cones and then dipped in white chocolate melts tinted mint green and pale pink–so cute! These we’re actually much easier than a normal cake pop as the drips down the sides added to the melting ice cream cone look :0). This was such a fun themed party, and the party set-up at the client’s house was fabulous (wish I had a good picture, but they all turned out too dark). Hope you had a great 3rd birthday, Mackenzie! I loved making your treats!! I was asked by my very best client to do the desserts for a shower for her lovely niece. Along with the cupcakes, the bride-to-be asked for a cupcake bouquet to use as a centerpiece. Her color pallet included sage green, avocado green, and some grays. I decided that she needed a bit of color, so I added some purple to the gray and came up with a deep violet as an accent color (although these pics look blue, it’s actually a dark violet). 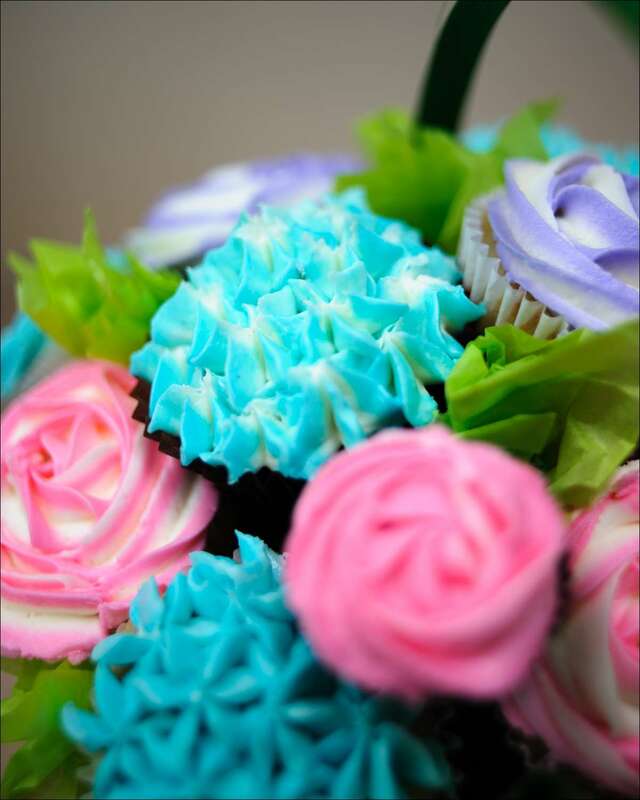 These cupcake bouquets are so fun and versatile. You can do up to 3 colors and I try to include a few different types of piped flowers to add variety, texture, and interest. This one I did in a 7″ basket and it has about a dozen regular-sized cupcakes and 6-7 minis. People are always asking about prices on the baskets. For this size (about 12″ diameter with the cupcakes), it’s $46, which includes the basket. If you have a container you’d like to use, I can do that also. Generally speaking, depending on the basket, you can figure $3-4 per cupcake for a price of one of these beauties, lovely enough to adorn any table or a sweet surprise for anyone in your life…better than flowers– they can EAT it!! Thanks again for the order, Deb, and congrats to your niece!! 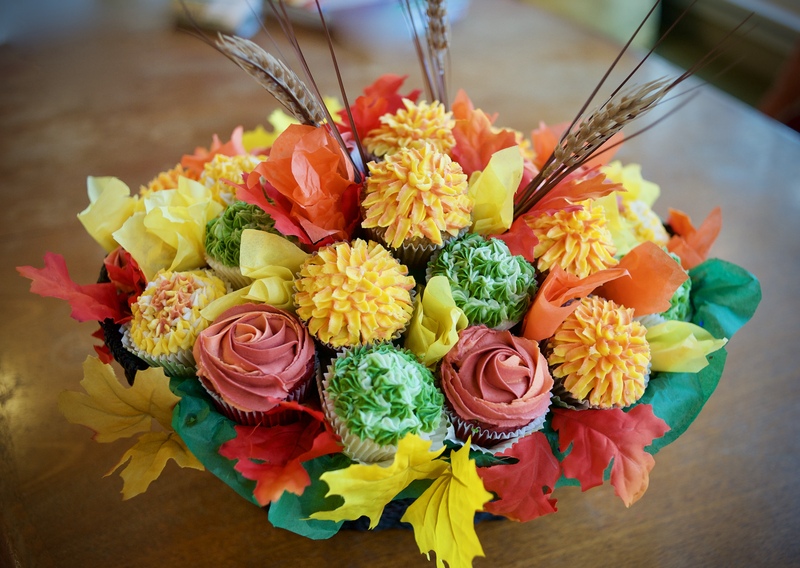 I am just crazy about these cupcake bouquets! I made them last year for Mother’s day…Such a nice thing to give your mom to show her how much you care. They’re so bright and cheery and are sure to brighten anyone’s day–maybe even MORE than real flowers. Why? ‘Cause you can EAT ’em! The best part is they can be customized to your cupcake flavor preference, color combination, even flower type…what’s not to love about that? The hydrangeas were piped with a Wilton 1M tip and the roses with a 2D tip. I variegated the colors by layering them with white in my piping bag…they look much more realistic that way. So fun, so sweet, so colorful….perfect for every season! Whew! It’s been a busy month and I haven’t had time to post much of what I’ve been up to. So I’ve decided to lump a few of my sports-themed creations into one post…Seems like there are lots of sports enthusiasts out there! 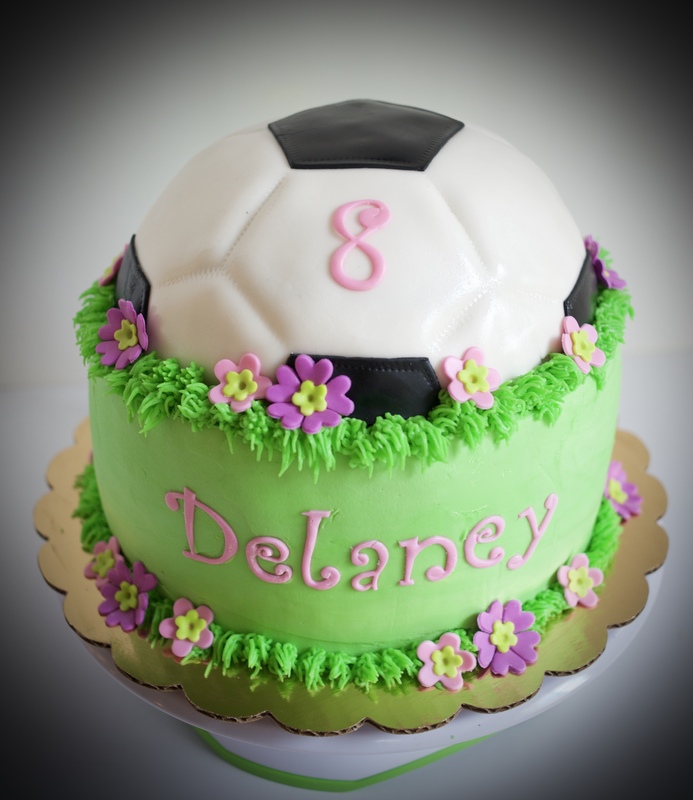 Delaney’s cake is a 9″ round vanilla cake with a 6″ball on top (brown sugar caramel cake with caramel cream filling). The base cake is iced with vanilla-bean buttercream. and the grass is piped with a grass tip. The flowers are made from homemade marshmallow fondant as are the letters. To get the look of the soccer ball, I covered the half round cake with white fondant and added the pentagon shapes cut from black fondant. I used a seam tool to make the markings and indents like a real soccer ball. I thought it came out great and it wasn’t too difficult to get the look I was going for . Cooper’s cake was a 10″ square double chocolate cake with marshmallow cream filling and vanilla-bean buttercream. The sports details were all made from fondant. I used a small ball pan to make the ball cake and covered it with different colors of fondant to look like the 4 sports balls (a bit tedious, but I like the final product). Happy birthday, Delany and Cooper! I really enjoyed making your cakes! The 6″cakes are chocolate, red velvet, and banana. They are frosted with vanilla-bean/chocolate buttercream with fondant details. And one more…check out these cute softball cupcakes I made for my daughter’s team party this past June. The cupcakes are a mix of vanilla and chocolate with an Oreo cookie baked into each. They are smooth-iced with green buttercream and the edges are “rolled” in crushed Oreo cookies. I then piped green grass on half of them and added a bat and ball made of fondant; the others have large fondant softballs. The stitching is drawn with edible red pen. Ok, just one-more-one-more! Football cookies made for a sweet girl who’s flag football team won the Flag Football Super Bowl this past weekend (congrats, Sophia! ).